We get Fine Cooking, and when it arrives in the mail, it’s always fun to flip through the pages and read about food and pick recipes to try out. We do end up using many of the recipes, though probably not as often as we should…Then there are a few that we use all the time, over and over again…I think I’ve about memorized the Cream Scone recipe we’ve made it so many times! The pizza dough recipe from a recent edition looks like it will become another standby…we’ve already made it twice and it is really good. 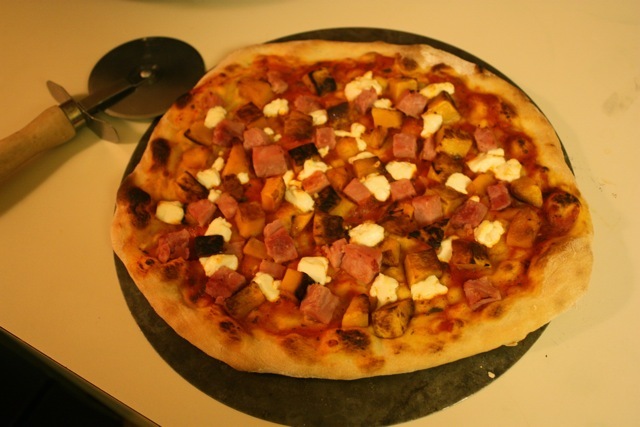 A couple of weeks ago, I was looking for a pizza topping and ran across A Zesty Bite’s Butternut Squash Pizza. We ended up using a red sauce, and it’s really good. Make the pizza dough ahead of time. The recipe calls for at least 3 hours in the fridge (so 5 hrs total), but we’ve had really tasty dough leaving it in the fridge for 2 days. Take the dough out and let it warm up for a half hour or so before rolling it out into pizzas. Dice and roast the butternut squash (450 for 20-30 min). Preheat the oven with a pizza stone in it to 450-500. 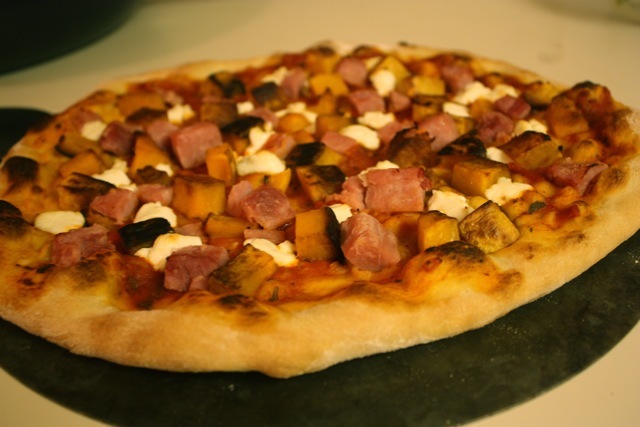 Spread the sauce on the pizza, top with butternut squash, ham and goat cheese. Bake until nice and brown.